Once the weather becomes nice there is nothing more satisfying than to enjoy time outdoors and entertain family and friends. 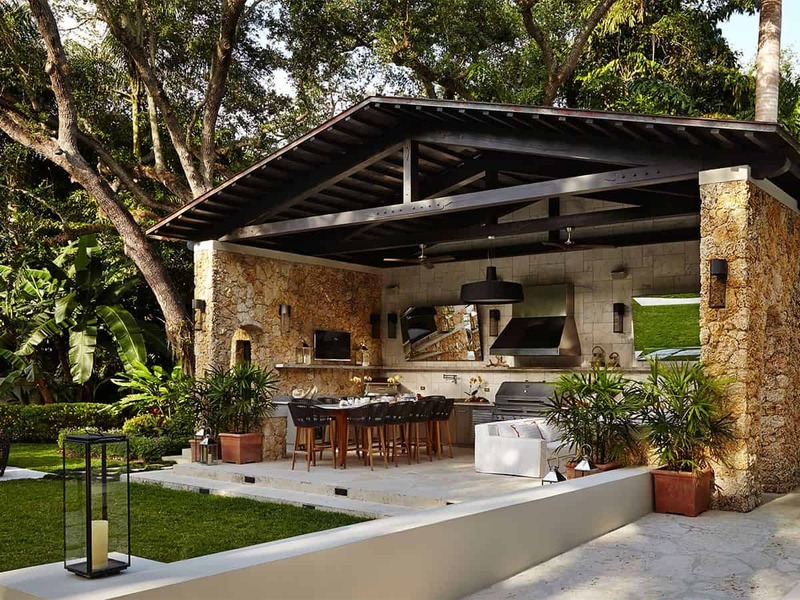 What better way to do just that then to have an outdoor kitchen. Outdoor kitchens have become extremely popular in the recent years because of their eye-catching aesthetics. 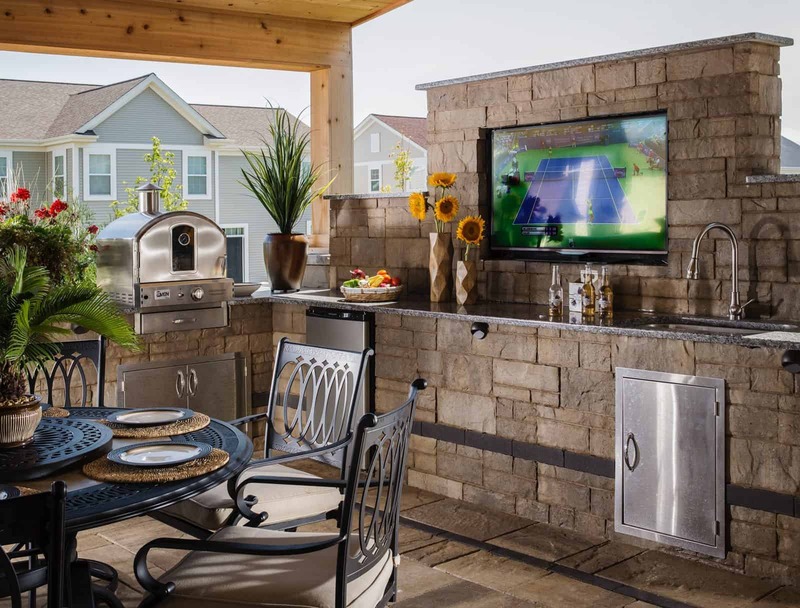 If you have the space for it, consider one of these outdoor kitchen ideas as a new backyard project your family will love and enjoy. 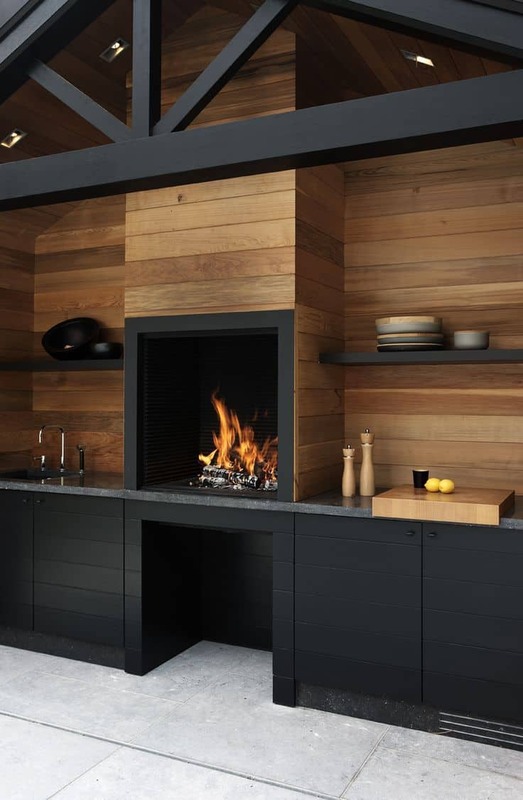 Adding a built-in grill is great when you want to maximize the space you have. It will already be built into your station allowing you to have the ability to pair it with a bar or even other cooking appliances. Use brick for that classic elegance that brings the space together. There is nothing quite like barbecuing on a hot summer day. The key is having a grill that offers everything you would want from a grill without taking much space. 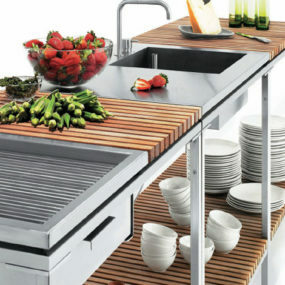 Pair your grill with a food prep station to have the ultimate space for grilling and creating the perfect meal every time. Take your rustic onto the trendy side by adding a few modern elements that bring out the hues you already have going on. 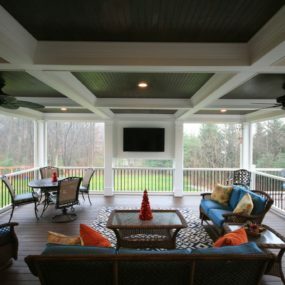 If you want to create a personalized space add a dining table or even a tv to create that indoor atmosphere outdoors. Shabby chic, rustic outdoor kitchens are still here to stay. Constructed out of brick a rustic kitchen will bring that classic, rustic appeal that may well be needed to add to the space. Consider having brick floors added in to perfect the rustic touch. You may also want to add wooden furniture or selected pieces. 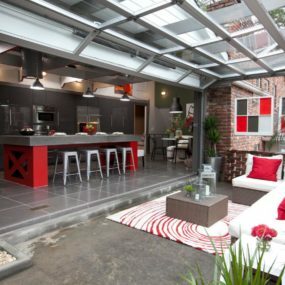 Do not be discouraged if you can’t afford to have a lavish outdoor kitchen or if you don’t have the required space. Keep it minimal and sweet by having a cohesive layout with only the necessary kitchen appliances. 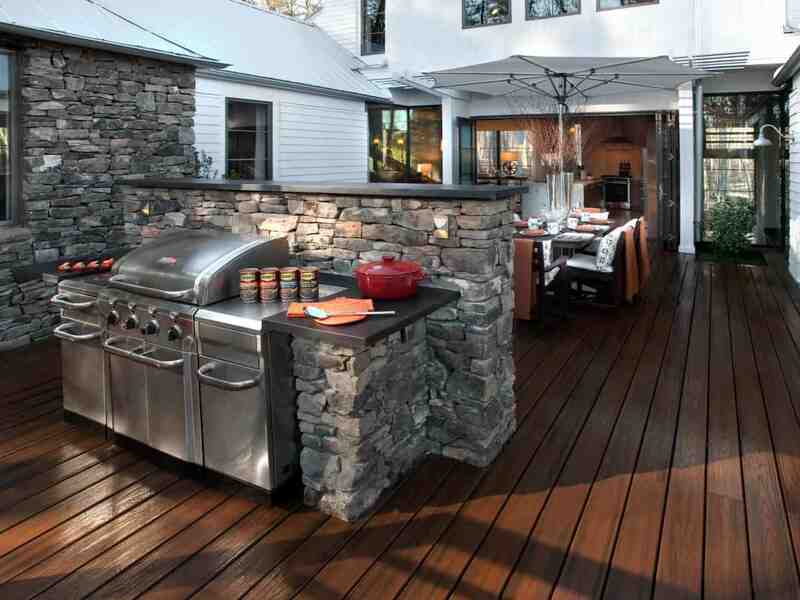 Doing so will give you the outdoor kitchen you deserve without the price tag. 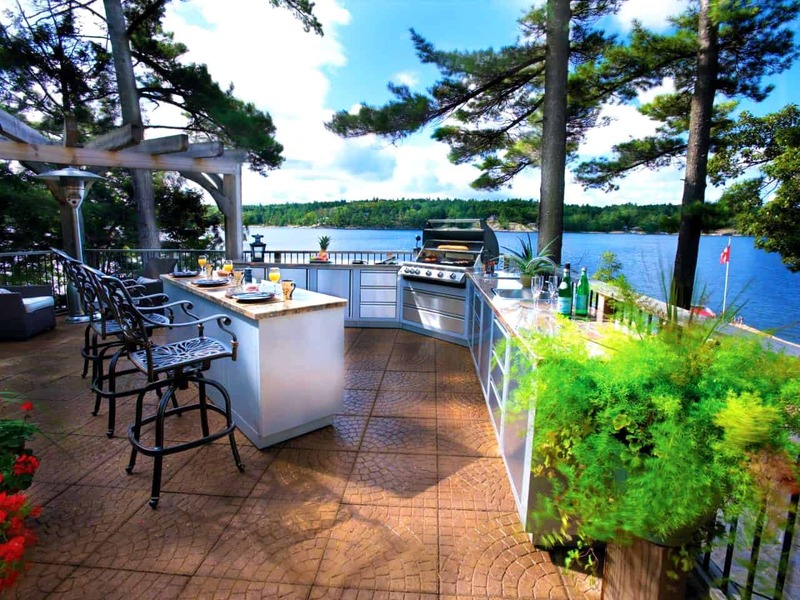 If you do not have a grandeurs space, you can still have an outdoor kitchen. The idea is to have a minimalist kitchen area that comes to life even in the smallest space. 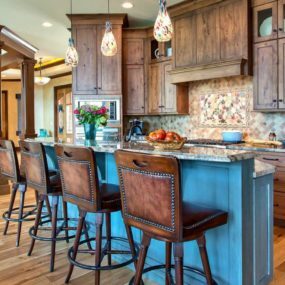 Keep the décor minimum and allow the kitchen to become the main focus. Take your outdoor kitchen a step further with a pizza oven. Consider having both for the perfect addition to any outdoor kitchen. Keep the rest of the decor minimal to allow your pizza oven to become the staple of the home. 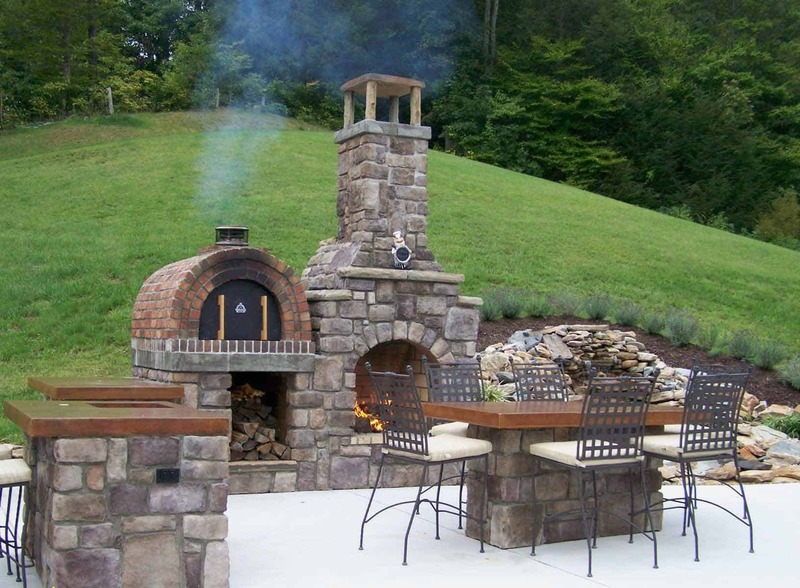 Having a pizza oven is the perfect additional factor to your outdoor kitchen. 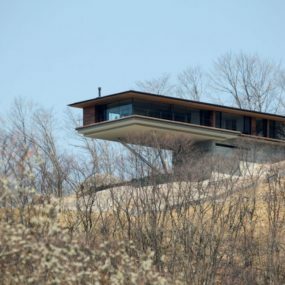 It’s contemporary and lavish all at the same time. It provides an undeniable warmth that almost feels too good to be true. Take it a step further with a clay pizza oven paired with silver appliances. There is nothing that fits better in an outdoor kitchen than having a shielding pergola that protects the space from the weather while still allowing you to entertain and cook outdoors even when it’s raining. Doing so will allow you to enjoy your outdoor space all year round. Every chef needs a shielding space for their new outdoor kitchen, that is where an open pergola comes into play. The idea is to have some coverage that shields your new silver appliances. 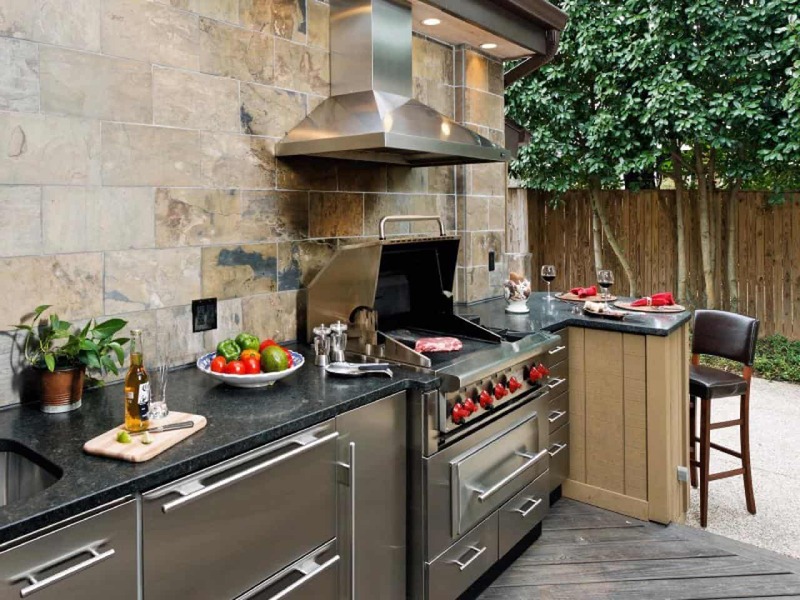 An all silver appliance, outdoor kitchen is perfect for an upgraded appeal that is still classy and put together. An outdoor bar is the perfect addition to an outdoor kitchen. It makes sense to have a built-in grill, food station, other cooking appliances and a bar that adds to the entertainment. The key is working with neutral hues that help the space feel cohesive and put together. 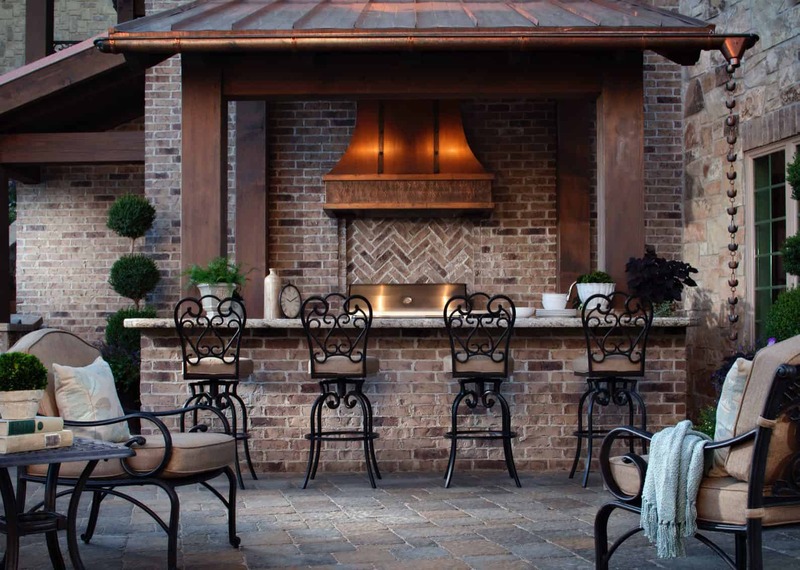 An outdoor kitchen with bar is the perfect entertaining piece to have. It adds a seating area for guests while still providing that classic piece that will add to your kitchen space. Consider marble as the main focus for that classic modern twist. 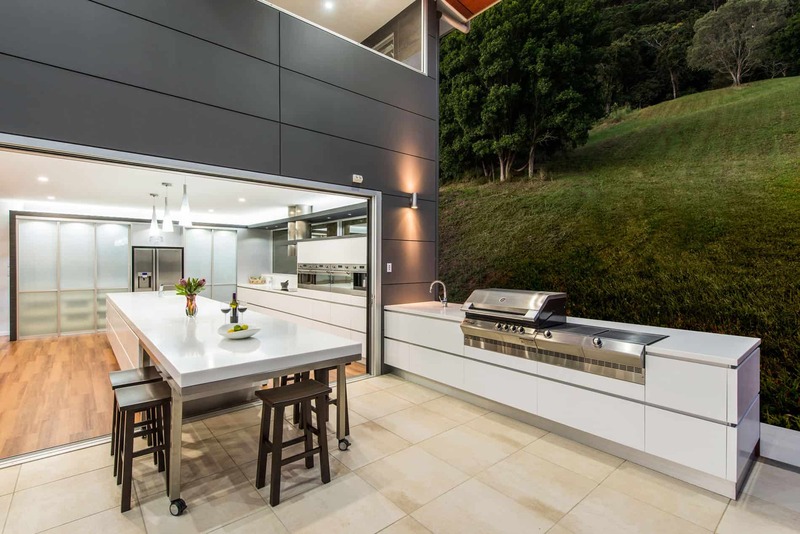 A contemporary outdoor kitchen is cool because it features clean, crisp lines that still have everything you want and need without using the traditional wooden feature instead using stainless steel with neutral hues and pair it with a clean table that works in your outdoor and indoor space. 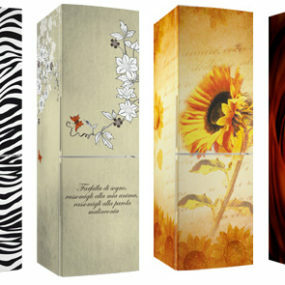 Go contemporary with the ultimate stylish, clean, crisp décor that screams trendy. 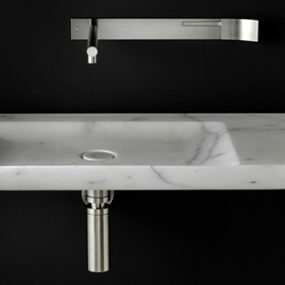 The idea is to make the space appear sleeker so sleek that its contemporary. Pair the décor with metal stools to give that rich, trendy feel that perfects the space. Country chic is elegant and simple but when paired with dark shades it brings that put together feel that is still trendy. Have the darker hue work with the wood to bring that cozy feel even on the warmest summer days. We love a country chic kitchen, whether it’s outdoors or indoors. 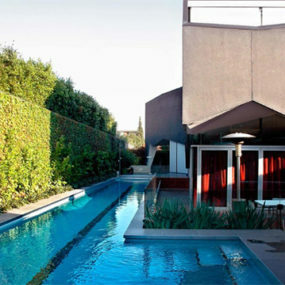 However, for the outdoor space take a ride on the wild side and add a modern twist. Instead of having only wooden features paired with light hues, use dark wood and bring a deeper touch that elegant yet still feels country chic. Pair with gold pieces to complete the new look. A kitchen and bar paired with a pool is the ultimate paradise spot. You will be creating the perfect place for you while still being able to cater to your family and friends all at the same time. Customize the space to your liking by keeping the decor as fresh and resort-like as possible. 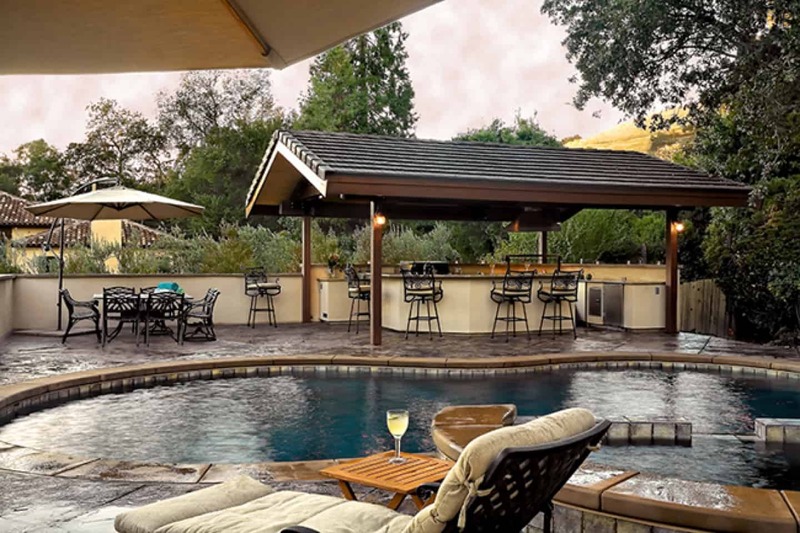 If you have a large enough space that allows you to have a pool area paired with an outdoor kitchen, this is the time to go for it. Add a curved marble bar to the outdoor kitchen for that seamless feel that almost appears as a resort. 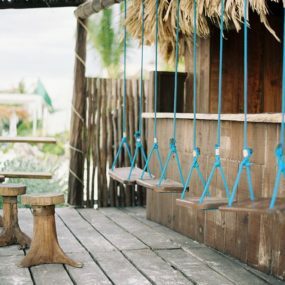 Keep the space as resort feeling as possible. Doing so will bring you the classic outdoor feel with an immediate upgrade. Building your own backyard kitchen can give you an undeniable satisfaction that brings your entire space together. Keep the decor simple and only with the items you need for the perfect DIY project. Consider using elements you are familiar with to keep the space personalized. If you use a lot of wood throughout the year and are quite handy, you may want to consider creating your very own outdoor kitchen in a storage manner. Creating a storage like outdoor kitchen works perfect for those with little to no space but still want the classic kitchen appeal. Add a few chairs and you are set to go. Have any other outdoor kitchen ideas? If so, please share with us your thoughts below.